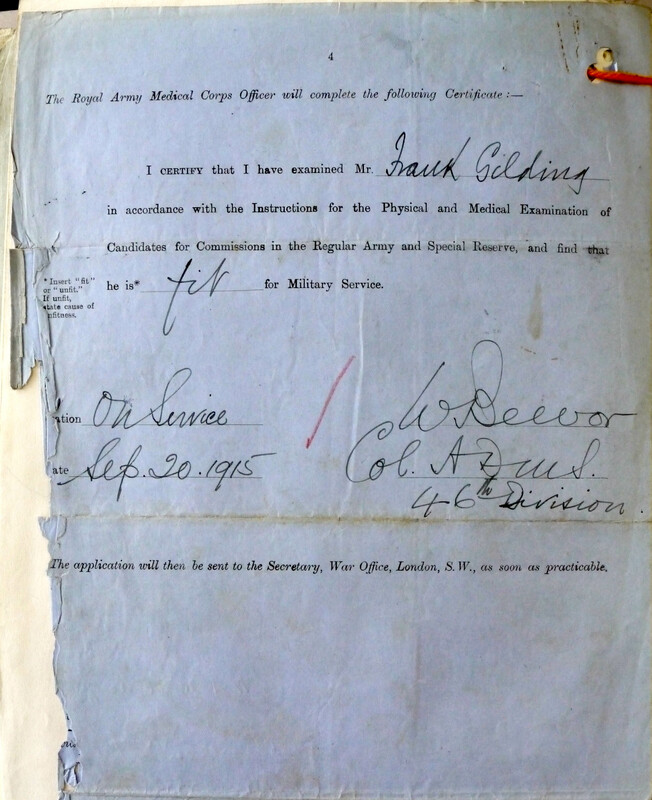 The final page of Frank Gilding's Commission Application, September 1915. 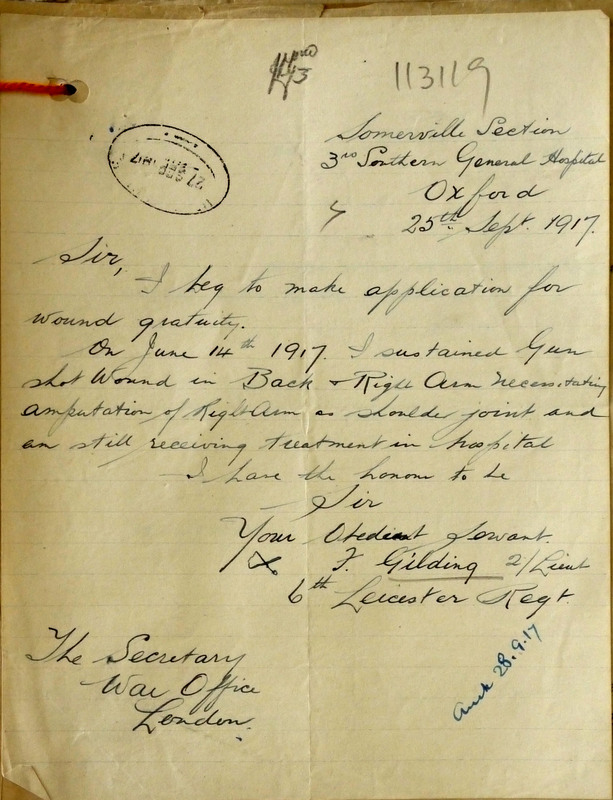 A letter sent by Frank Gilding from his hospital bed on 25/9/1917 to apply for a wound gratuity (he was granted £100). The excellent hand-writing is deceptive, as the cross next to his signature shows - the letter was written out for him after he had had his arm amputated. 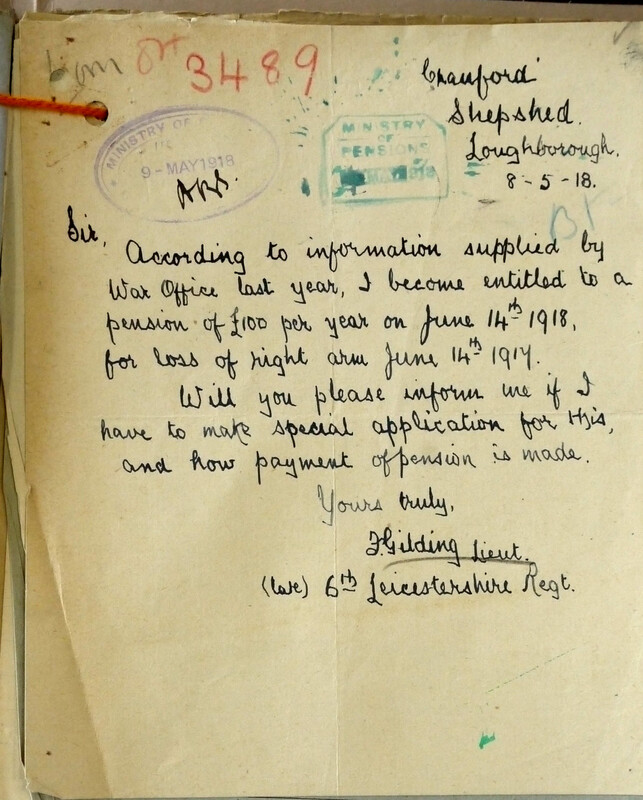 A letter 2nd-Lt Frank Gilding wrote to the War Office, May 1918, regarding delay in payment of his war pension. The spidery hand writing arose from the fact that he had lost his right arm was having to write with the left (he was probably right-handed). Frank Gilding was born in Bottesford in 1890, the youngest child of Daniel and Mary Gilding. Daniel was born in 1852 in Bottesford, Mary in Barkestone le Vale in 1855. In 1891, Daniel Gilding worked as a bricklayer’s labourer and the family lived at the west end of High Street. There were five children, Tom (11), William (9), Mary (6), John (4) and Frank (1). In 1901, the Gildings were living on High Street near to the home of Walter Miller, the butcher. The children still living at home were John (14), Frank (11), Arthur (9) and Elizabeth (5). John was working as an apprentice ironmonger and brazier. Arthur Gilding emigrated to Canada in 1911, and became a Corporal in the 8th Battalion, Canadian Expeditionary Force. He was injured and died of his wounds on 13th September, 1916. Frank was at school in 1901. The school logbook recorded that on the 22nd September, 1902, Frank Gilding won a bronze medal in a competition about Canada, after reading books and atlases had been given out in connection with Lord Strathcona (Donald Alexander Smith, 1st Baron Strathcona and Mount Royal, 1820 – 1914, Scottish-born Canadian who became one of the British Empire’s foremost builders and philanthropists. Wikipedia). There was an examination on the Geography of Canada and Frank Gilding came first in the school. Following adjudication in London, he received his Bronze Medal. He was also awarded a County Junior Scholarship in 1902, coming first in the county with a total of 515 marks, a record. By the 1911 Census, Frank Gilding had left home and was living at Belton Street, Shepshed, employed as an elementary schoolmaster by Leicestershire County Council. After heading the county juniors, he had attended Sedgebrook Grammar School and Grantham Technical School, before going on to St John’s college, Battersea. St John’s was one of the country’s first teacher-training colleges. On receiving his teaching diploma, he was appointed assistant-master at Shepshed C.E. schools. 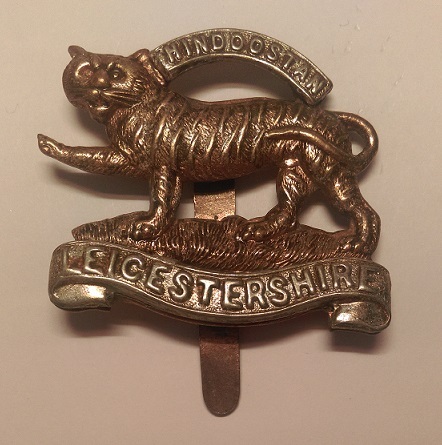 Frank Gilding served in the Leicestershire Regiment, Service Number 1380. His Medal Index Card reports that he was awarded the 1915 Star, the Victory Medal, the British War Medal: his medals were dispatched on the 6th April 1921. He entered Theatre no.1, France & Flanders, on the 28th February, 1915. His home address was Cranford, Shepsted [Shepshed], Leicestershire. After joining as a Private, he was promoted to Company Sergeant Major, and received his Commission and promotion to Second-Lieutenant. News of his promotion was given by the local press. Grantham Journal, 29th January, 1916: Army Promotion – Company Sergt-Major Frank Gilding, 5th Leicesters, who a short time ago returned from France, and was given a commission, has been promoted to Second-Lieut., and posted to the 19th Leicesters. He is now in Devonshire. He was transferred to the 6th Battalion of the Leicesters, possibly on promotion to 2nd-Lt, though this is not entirely clear. Following this good fortune, he married Olive Mary Wood, at Loughborough, in the second quarter of 1916. However, during the latter part of the war, he was wounded more than once. On the 22nd July, 1916, the Grantham Journal reported: The name of 2nd Lt Frank Gilding appeared among the list of wounded, and in the afternoon the news was supplemented by a letter from Lieutenant Gilding saying he had been in hospital in Boulogne for a week. He had been injured by a shell, but not seriously, and hoped to be out of hospital in a day or two. He was wounded again, later that year. On the 7th October, 1916, in the Nottingham Evening Post: Second-Lieut. Frank Gilding, Leicestershire regiment, is reported wounded for the second time within a period of a little over two months. He was an assistant master at the Church of England schools in Shepshed, and at the outbreak of war held the rank of sergeant in the Territorial Force. He received his commission in January last year. Worse was to come, as reported by the Nottingham Evening Post on the 25th June 1917: Wounded. Second-Lieut. Frank Gilding was previously wounded in July last, and again in October. Prior to the war, he was an assistant master in the Church of England schools in Shepshed, and held the rank of sergeant on the Leicestershire Territorials. He received his commission in the regiment in January, 1915. On the 7th July, 1917, Grantham Journal: There is more hopeful news. He has been removed to Base hospital and hopes for an ultimate recovery. He has suffered the loss of his right arm and severe gunshot wounds in the back. He resumed civilian life in Shepshed on being discharged in 1917, having been deemed “unfit for any service” on account of his injuries. He became involved in local affairs. He was appointed head-master of the Church of England School in Shepshed. He was a member of the Urban District Council, and active in the local branch of the Discharged Soldiers’ and Sailors’ Society, which merged into the British Legion. He was also Secretary and Treasurer of the Sunday School Clothing Fund. Frank Gilding, headmaster of the Church of England schools, Shepshed, about two o’clock today, shot himself with a revolver in an outhouse at his home in Belton Street, where he lived with his wife’s parents. He is survived by a widow and two children. Mr Gilding was between 35 and 40 years of age. He was appointed headmaster about two years ago. He joined the army as a private, but was promoted sergeant-major, and later lieutenant, for bravery on the field. He was severely wounded twice, and on the second occasion lost an arm. The Post added, on the 31st December: A memorial service to the late Lieut Frank Gilding was conducted: the Parish Church, Shepshed, yesterday morning, by the Rev D.E.K. Llewellyn, Hon. C.F. vicar, which was attended by members of the Urban Council and other representative bodies. A more detailed report “Tragic death of Mr Gilding, of Bottesford” given by the Grantham Journal, 29th December, 1923, can be found online at The British Newspaper Archive [this link is to a subscription only site]. Severely injured in 1917, right arm amputated.